head on over to Without A Doubt to check it out! 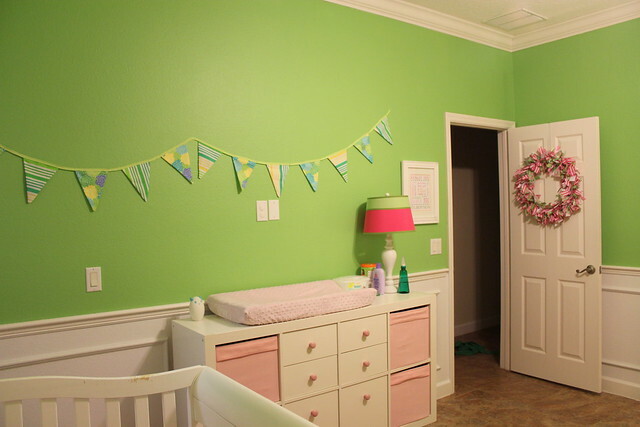 but at the same time, it also feels weird considering this room a nursery since she wasn’t a tiny baby here. It’s about to get a lot more grown up too when her crib is replaced with a toddler bed. 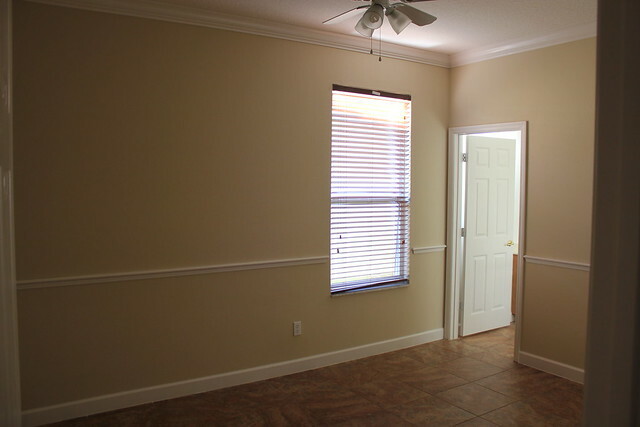 Here is a quick peek of what it looked like the day we closed on the house. Greg quickly got in there to paint the entire room before we were set to move the next day. so we were so very thankful to receive some hand-me-down furniture, that turned out to be perfect. We also added a few more decor pieces on the walls since there is a lot more wall space. and I will note the new stuff that we added. To give you a frame of reference, Kenley’s room is off the kitchen. 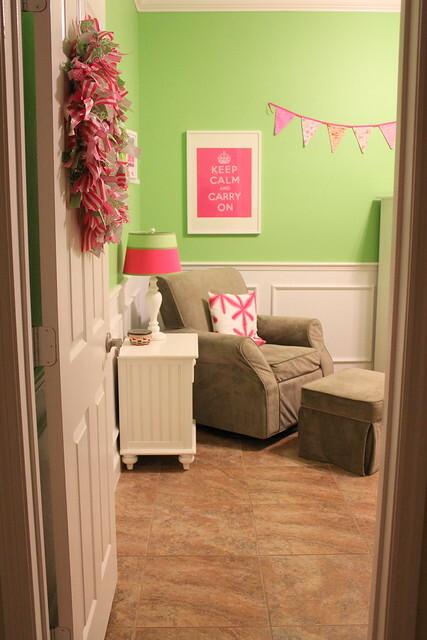 Immediately to the right of her doorway are the stairs going up (and child gate). 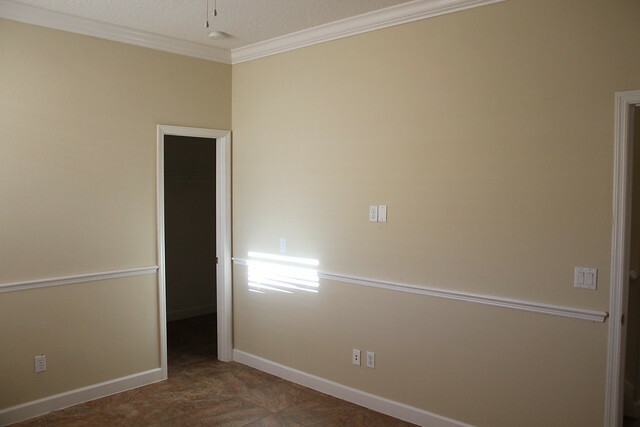 The third bedroom (now junk room, eventual second nursery), is immediately to the left, sharing a wall. I am in love with the paint color. 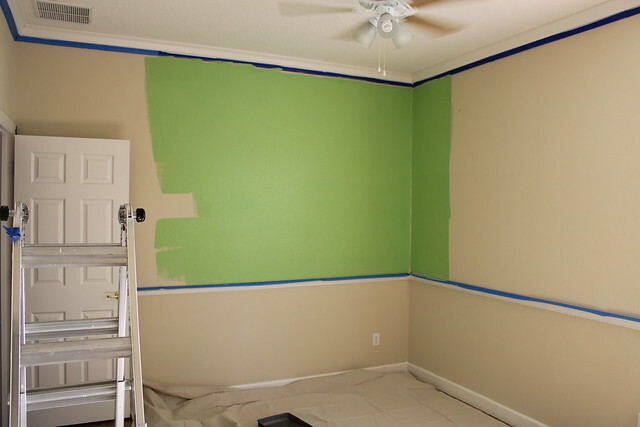 It is Pea Pod by Valspar from Lowe’s. so I am very happy to use them again. so an area rug was a must. 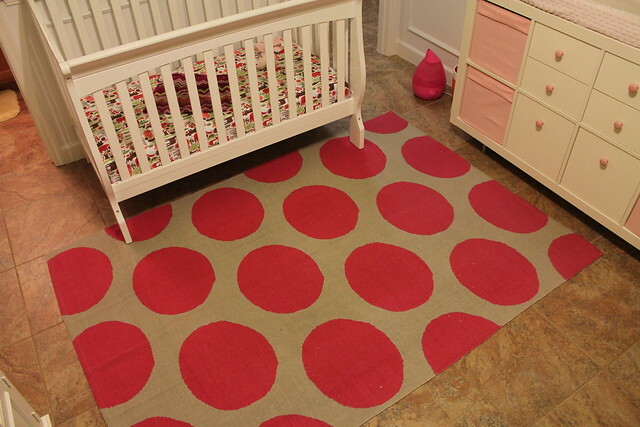 Her rug is from Urban Outfitters and it’s perfect. 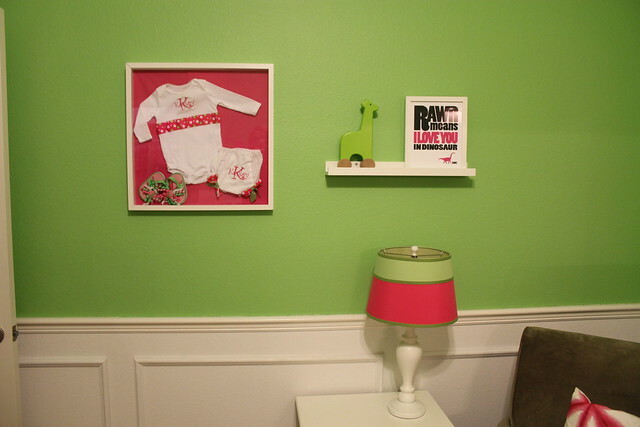 and framed Kenley’s personalized onesie, bloomers, and flip flops. It worked out perfectly that they are pink and green. The little giraffe was a birthday gift from Misha, so adorable. We still have the little white Umbra flowers that haven’t made it to the walls yet. due to the height of the window and ceilings, but I haven’t even looked for new ones. but the bathroom door and the closet door are still the lovely shiny brass. Slowly, we’ll be changing over all of the door handles in the house, so those are on the list. I would imagine we will be making the move to the toddler bed within the next couple of months. 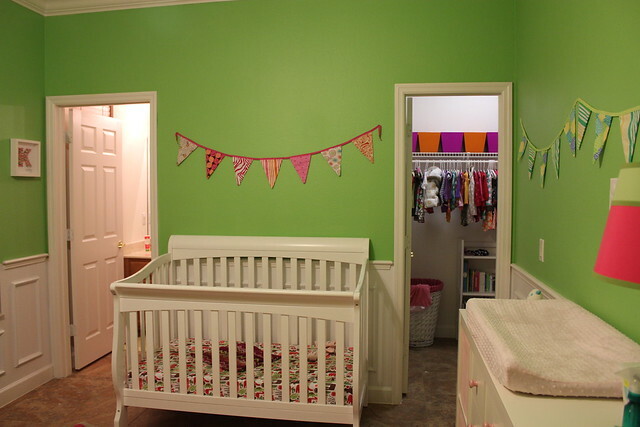 I already have the bed picked out, and I think it will go where the crib is now, but we’ll see. but I would like to put a little reading nook in there and make it all cozy. It also could use some serious organization. I’ll spare you the photos for now. but I don’t think we will paint it. I’ll leave that to her to do when she’s older. I was very sad to leave behind Kenley’s first nursery. We put so much love and thought into that room to make it perfect for her. wondering what it would be like with her there in my arms. 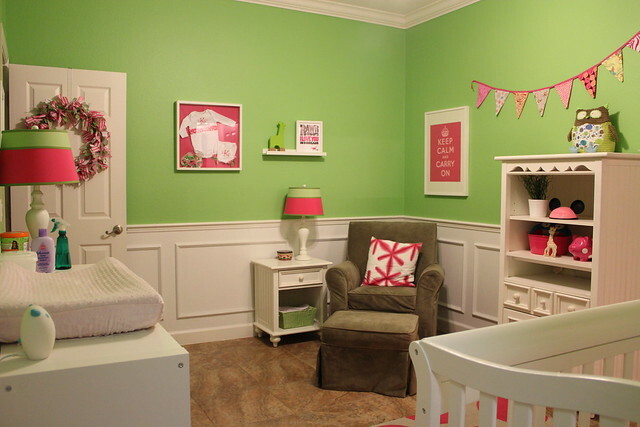 but I love this room and I love that she is going to grow up here. I am anxious to see how it will evolve for many, many years. Thank you Amanda! You for sure need to do bunting, and it is in no way “stealing”. It was a lot of work, but I’m so glad I did it. So cute! 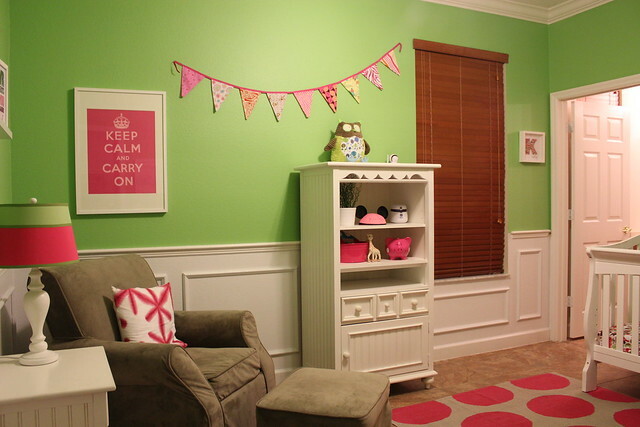 What a great room for Kenley, it looks so big!